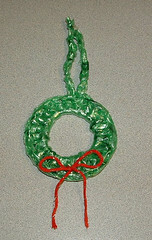 Here is my green plarn wreath. I crocheted this using plastic recycled from packing pillows cut into plarn. 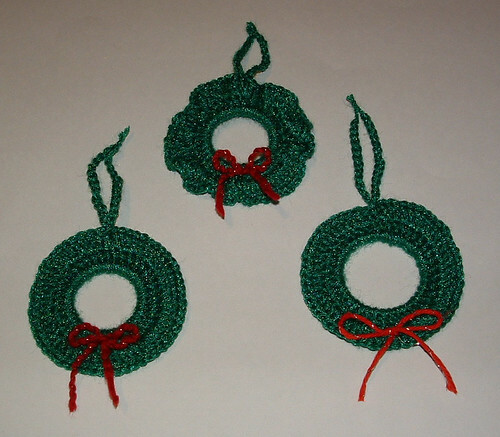 I did just a single round of double crochet stitch around an apple jug ring for this little wreath with a J crochet hook. A small piece of red cotton yarn was used to add a bow to the wreaths. That’s all it takes to make these cute and quick little recycled wreaths. Enjoy! These are awesome! I’ve been saving mine for another project, but I haven’t had time to finish it yet. Dang it, they won’t be done for Christmas! Love the recycled bags. I have 2 boxes of plastic bags from our balloons, would love to send to someone who can use them as I don’t crochet. Send me an email if you would like them. Rose — I sent you an email and would love to have your balloon bags. 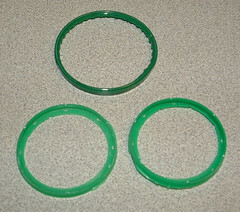 I will either use them myself or share them with another plarn crafter. Thank you so much.